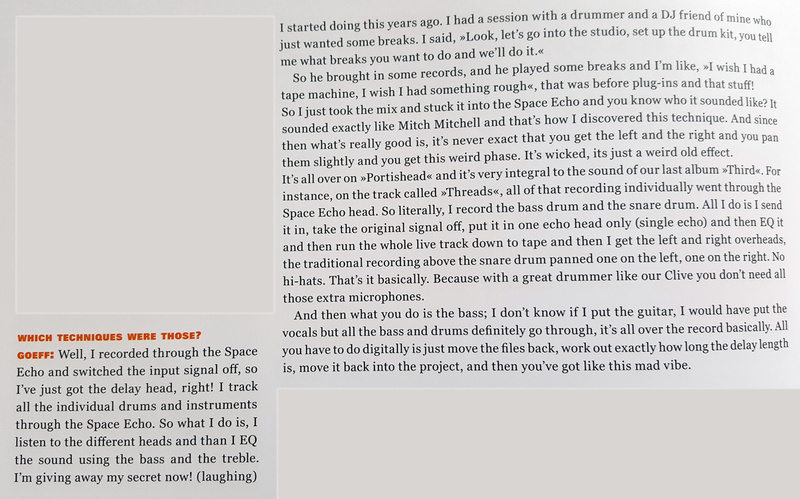 Here's an excerpt from the excellent R Is for Roland book, Geoff Barrow (in this case: "Goeff") mentions his/their work w/ Space Echos. I've got a 201 - of which the band owns many - and don't know how to replicate this particular technique ... specifically, only returning the echo tape head sound, and not the original input, ASSUMING that's what they're doing here. Is what they're doing possible w/ a 201, or am I misunderstanding, or maybe they're using a modified or different Space Echo model? etc. Hook it up as a send and return, like any other hardware effects unit. IIRC there's nothing special you have to do on the RE-201, although last time I used one that was was 1998 so I may have forgotten! Or have you only ever used plugins? In which case such routing might seem mysterious- one of the problems with audio in a virtual environment. The concept of routing gets a bit lost because the software takes care of it for you. Heh, yeah, I'm a hardware guy (though in a strange middle ground right now, switching very late in the game to Logic). Sorry, should've clarified in my original post, guess an fx loop is the only way ... was just curious if I was somehow missing a way input/output balance directly on the 201. Thx for the chime, though. Do you not get a 100% wet signal if you turn the echo volume knob all the way to the right? I thought it was a mix knob, rather than a blend. Could be wrong though.